Why Are the Bees in the Pool? 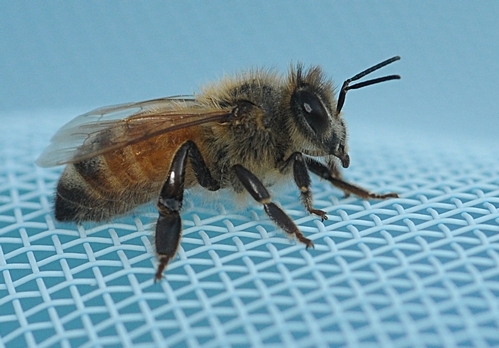 The declining bee population: Does chlorine in a swimming pool have anything to do with it? Ever since PBS NewsHour correspondent Spencer Michels interviewed Extension apiculturist Eric Mussen of the UC Davis Department of Entomology and several other UC scientists and bee folks on the declining honey bee population, it's been busy on the bee front. Everyone seems to have a theory on the cause of colony collapse disorder (CCD) and why the bee population is declining. One person, known as "DK," posted a comment on the PBS NewsHour site that maybe chlorine has something to do with it. "Every morning, when I sweep (skim) the family pool here in Sherman Oaks (Los Angeles), Calif., at least 3-4 bees from a hive in a nearby hedge are dead in the water, and I don't think it's from drowning," DK wrote. "It's like the La Brea Tar Pits were eons ago: The sparkling pool looks like potable water, but it just lures them to their deaths...When I "googled" this subject, it turned out a farmer in the San Joaquin valley who was experiencing colony collapse discovered that a neighboring farmer was using a chlorine based pesticide in his irrigation water on the adjacent watermelon patch; when I read further into it, the article said chlorine was a suspected 'neuro-toxin" for the bees, and that corresponds with my empirical observations. The chemical component also might explain why only 25% of bee colonies are experiencing this problem." "So, scientists in northern California and elsewhere, that's your clue: CHLORINE (and its derivatives). It's worth a look." "I read with interest your concern about a possible connection between chlorine and our honey bee problems. 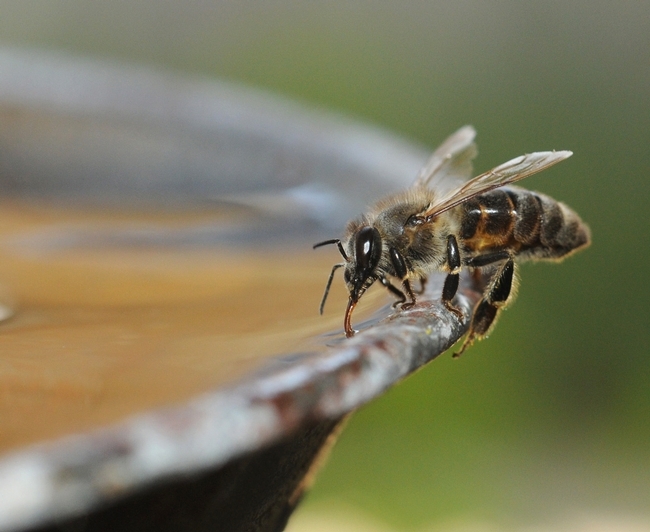 I believe that you are correct that honey bees actually prefer a bit salty water to pure water, so they might be attracted to your swimming pool water. 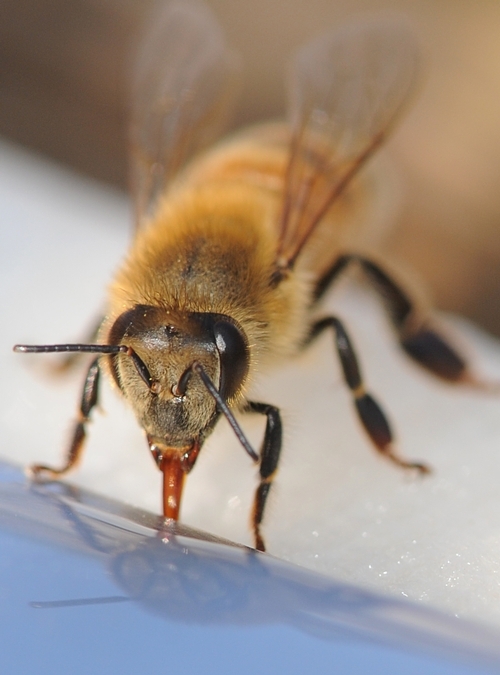 However, honey bees do not like to get their feet wet when collecting water, if they can help it. They stand on the dry and drink from the film of water caused by capillarity. If you find one drinking water near your pool, on the poll apron, pool wall or a floating toy, check their behavior. "The bees you find in the pool probably were not there for drinking purposes. You noted that you have a colony living nearby. Each day that colony raises about 1,000 newly emerging adult workers and around six weeks later those 1,000 bees will die of old age. They do not die in the hive. They tend to keep foraging until they flutter to the ground (lawn, driveway, sidewalk, pool, etc.) wherever they may be. Those bees are not yet dead, so for a little while they still can sting if bumped against or stepped on. That is most likely why they keep ending up in your pool. "In reference to your statement about chlorine in pesticides harming a beekeeper's bees, there have been a succession of pesticides with chlorine incorporated into their structures that are toxic to bees. The group named organochlorides are pretty much obsolete, but a new group of chemicals, called neonicotinoids, have a chlorine in them. Beekeepers fear those compounds because they become systemic in the plants and are found in the nectar and pollen when the plants bloom. Recently, the systemics have been delivered in irrigation water, since they can be picked up from the soil by the plant roots. In 'chemigation' with underground emitters, you would think that the chemicals would stay away from the bees. But, the systems leak and the bees will forage at the junctions in the pipes and from puddles on the ground. So, the bees get the chemical at field delivery concentrations, not at the much reduced concentrations that end up in the blossoms." Speaking of water, as any beekeeper will tell you, bees don't like to get their feet wet. 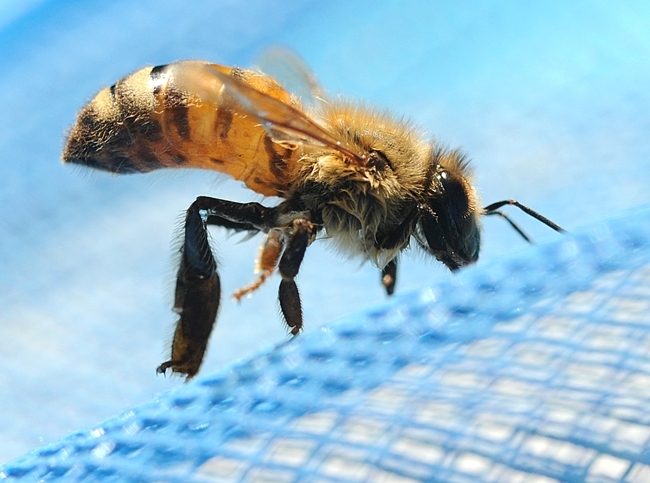 Honey bees don't dive into a pool on a hot summer day. They don't head for the sprinklers for a quick shower. They don't stand in water. 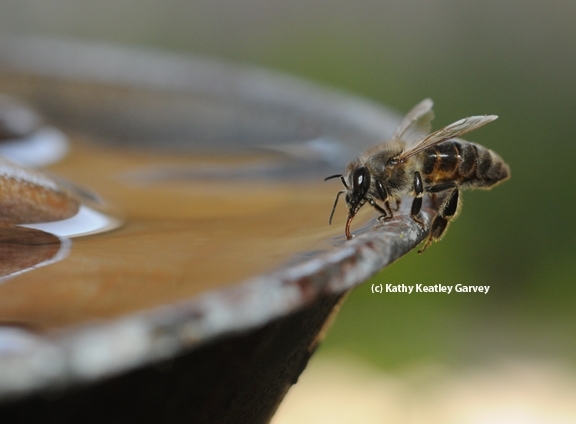 When they collect water to cool their hives, they stand on the very edge of a water-filled container, such as a birdbath or the lip of a flower pot. Which reminds us: a recently published children's book (for ages 4 to 10) about honey bees seemed to have it all: colorful illustrations, catchy lines, and educational information about bees. One look at an illustration, though, and it's apparent that neither the author nor the illustrator know that much about water and honey bees. The illustration clearly shows honey bees walking in water. Three of them. Three of them happily walking in a water-filled birdbath. "What's wrong with this illustration?" I quizzed a veteran beekeeper. He looked at me as if I'd just asked him the second letter of the alphabet. "Bees," he said, "don't like to get their feet wet. Those bees in that illustration are walking in water. They don't do that." Diners know that a napkin serves a good purpose: touch the lips with it or protect the lap. 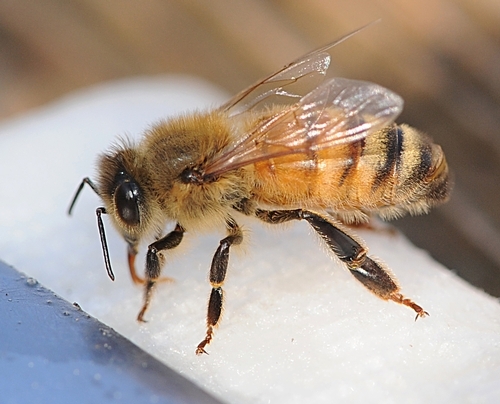 Well, honey bees occasionally use a napkin, too. A recent sun break--blue skies, 70-degree temperatures, no rain--resulted in honey bees foraging for water on a rain-soaked napkin on the patio. They came in twos to stand on the napkin to sip water. 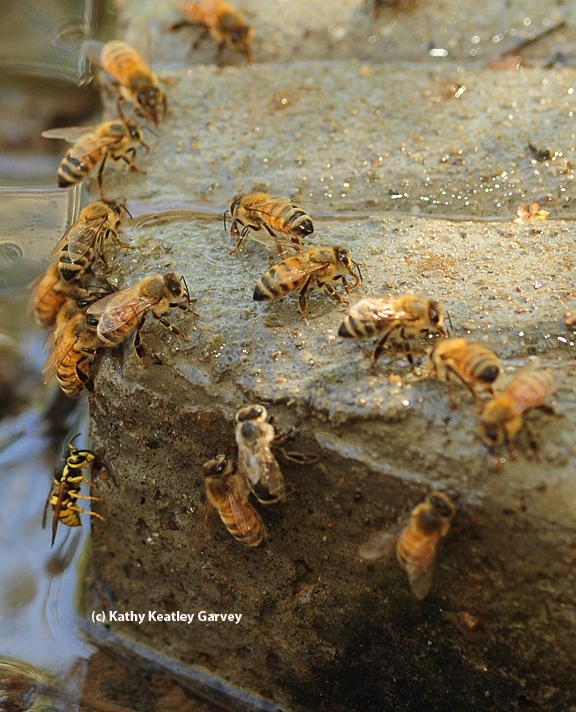 "Water foragers tend to forage at the water source nearest to their colony," writes honey bee expert Norman Gary, emeritus professor of apiculture at UC Davis, in his recently published book, Honey Bee Hobbyist: The Care and Keeping of Bees (BowTie Press). "Minerals, salts, gases, organic compounds from organisms in the water and other unknown elements influence the bees' preference of water sources," he wrote. "Only the bees know the secret ingredients that determine their choices; otherwise bees would be able to create super-attractive watering holes with special flavors to lure bees away from swimming-pool decks, drinking fountains and birdbaths, where they are sometimes perceived as a problem by beekeepers." All honey bees are welcome in our yard--with or without a napkin. The bees are dropping like flies--in swimming pools all over northern California during this triple-digit heat wave. 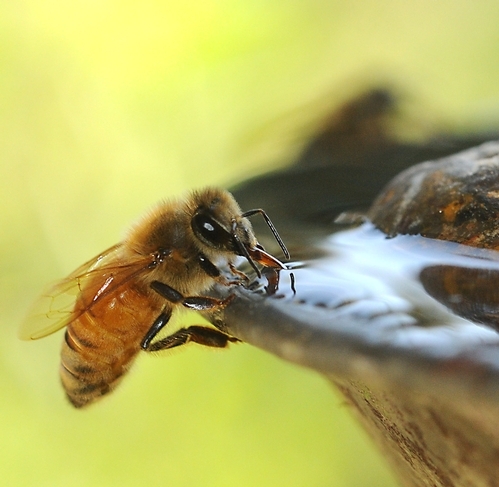 Honey bees collect water to aircondition their hive. They sip from bird baths, dripping faucets, water-splashed plants and even wet laundry hanging on the line. They return to their colony where they release droplets of water. The buzz of hundreds of wings fanning the hive sounds like hundreds of super-charged fans or a ramped-up swamp cooler. "This hot weather is really hard on the bees," said bee breeder-geneticist Susan Cobey, manager of the Harry H. Laidlaw Jr. Honey Bee Research Facility at UC Davis. 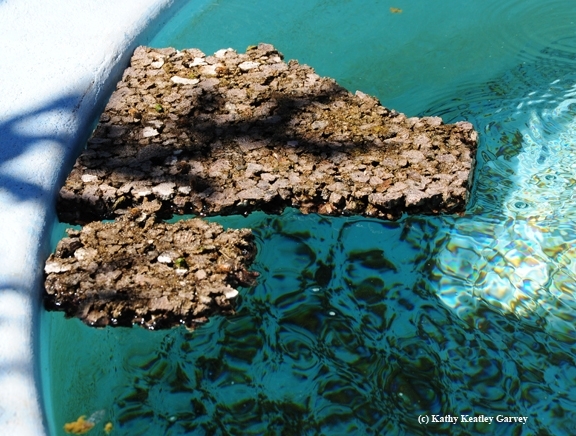 Unfortunately, bees searching for water can fall into swimming pools and perish. 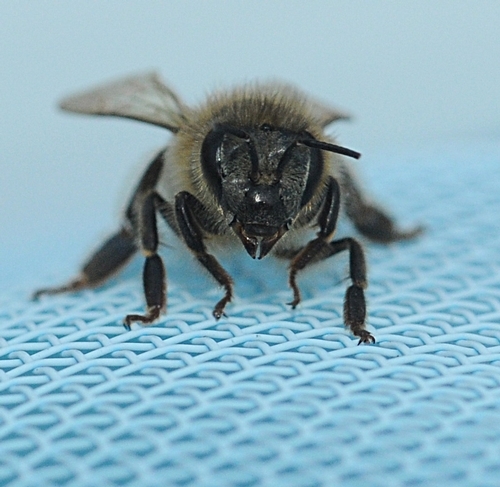 Last weekend we netted about a dozen bees from our pool. All survived but one. Another looked like a goner. The water-soaked bee stood on the net--nothing but net--all night long. The next morning she raised her head, spun her wings and buzzed off. Really, I'm not into bee-ing a "bee lifeguard" or admininistering "bee CPR."